Take a look at the ingredient panel on your pet's food. 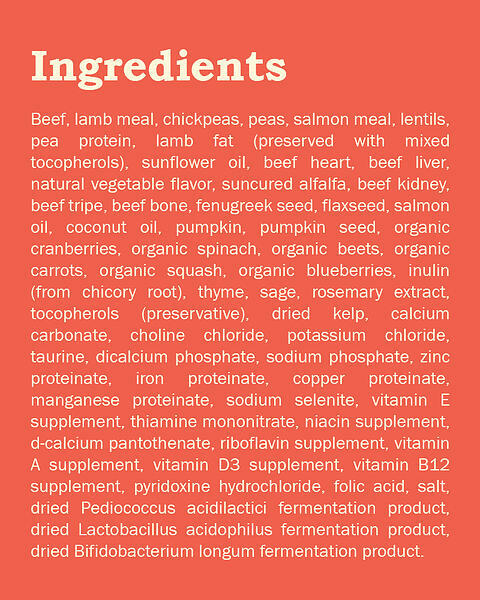 Outside of the few recognizable ingredients at the top of the list, it looks like gibberish to most of us. How do you know what you're feeding your dog if you can't even pronounce half of the ingredients? This article is going to help you decipher some of the lingo, get a better understanding of what's actually in your pet's food, and determine what the manufacturers are trying to cover up with strategic wordplay. As if the dog food industry isn't confusing enough, now we have to take a look into the marketing side of things. Manufacturers are required to follow certain laws that dictate how they are allowed to label certain things on their packaging. Unfortunately, there is a lot of grey area in this process, and navigating this can be a bit tricky. Here is some insight into how you can avoid poor quality foods that use very clever language to influence how we perceive their products. Occasionally with our own food, we endeavour to browse through the ingredient list of our favourite products. Usually, we end up feeling quite overwhelmed by the long list of foreign ingredients and weird sounding additives. To try and recover, we usually remind ourselves of the other comforting claims of the product to help us feel confident that we’ve chosen a food that is still healthy, or at least not harmful. When it comes to our pet's food, that list can seem even more alien to us. Being able to understand pet food ingredients can help us get a better idea of the quality of the product, but first we have to learn how to decode the cleverly disguised marketing tactics and get down to the real nutrition in the food. Legally, manufacturers must list all ingredients of your dog food in order of weight. Unfortunately, that weight is determined before processing, so this will include the moisture content. This means you must be extra careful to avoid being tricked by clever wordplay. For example, "deboned chicken" sounds great, but it is full of moisture, and that moisture adds weight. Once the food gets turned into kibble (extruded), all of that moisture evaporates. Many of us already know that the very first ingredient of your dog food should be a named animal protein. However, this is where it gets tricky. Knowing that this animal protein was weighed before processing, it can be difficult to tell if that protein actually makes up a large portion of the finished product. For more details about some of the regulations surrounding pet food labelling, take a look at the Government of Canada's Guide for Labelling and Advertising of Pet Foods. Meat meals are often used in higher protein foods because the same weight of meat meal will have a higher protein content when compared to deboned or fresh meat. The quality of meat meals can be hard to determine, as meat meals must be comprised of meat and bone, but don’t always specify a source. Look for foods with named animal meals, like chicken meal or lamb meal, compared to something simply labeled meat meal or poultry meal. This doesn’t necessarily guarantee quality, but unnamed meat sources are generally considered poor quality in any format. Multiple animal protein sources, ranging from meat meal, whole prey, de-boned meat and even organ meats, should be included high up in the ingredient list to indicate a higher animal inclusion. Foods that include both meat meals and meats near the top of the ingredients list, can often indicate a higher-quality, providing both higher animal inclusion and fresh nutrient-dense ingredients. This tells us that 70% of the protein in this food comes from saltwater fish, 30% comes from produce and botanicals, and none of the protein comes from grains or potatoes. Most of the protein in this kibble comes from a meat source. Not every brand will be this transparent, and so it is a good habit to look for multiple meat sources lower in the ingredient list too. Although it’s commonly understood that the first five ingredients are the most important, make sure you read the whole list. Many companies try to hide poor quality ingredients in between good ones. Certain dog food ingredients should be avoided at all costs. Check out this article on these serious no-no ingredients to look out for. When reading the guaranteed analysis on your dog food bag, the protein percentage is made up of all sources of protein, not just animal. Carbohydrates, including grains, legumes, and vegetables, all make up part of the protein percentage. However, these proteins are not as bioavailable to dogs as animal-sourced proteins. In a premium quality formula, at least 50% of the protein should come from an animal source(s). Foods that don’t list animal protein as the first ingredient are unlikely to meet that standard. Almost always, the first ingredient in any high-quality food should be a named animal protein (ie. chicken, beef). Minimally processed named meats, whole prey diets, named meat meals, and de-boned animal proteins are some of the more commonly found healthy meat sources in quality pet food. 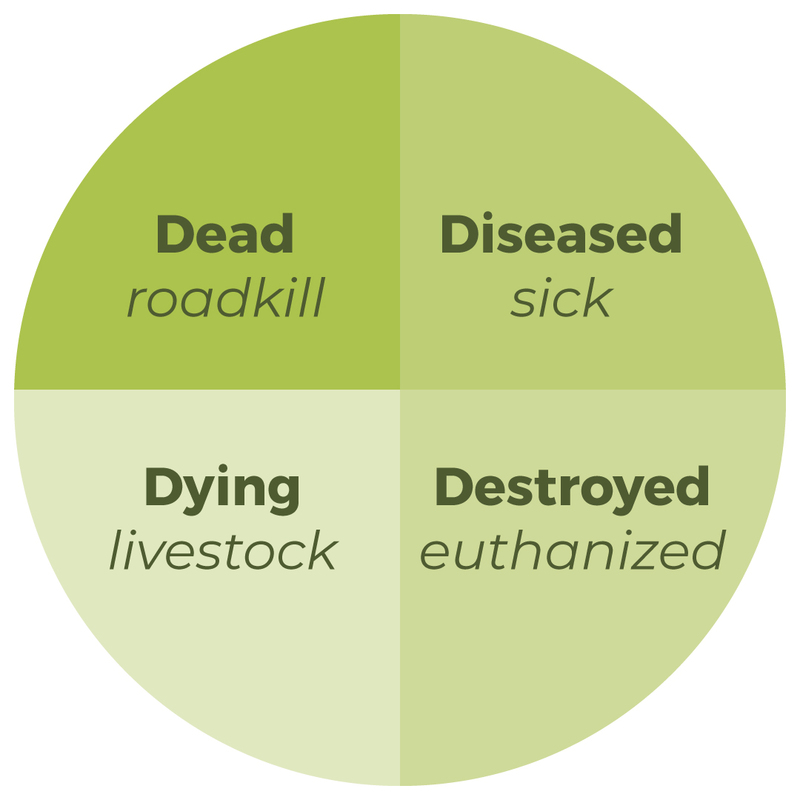 When the source of protein is not specified, the protein likely comes from rendered meats, which can be sourced from dead, diseased, dying, or destroyed animals (4-D meat). They could be livestock, roadkill, spoiled meats from grocery stores, euthanized pets from shelters and vets, and various other suspect sources. These meats are considered feed grade meats. 4-D protein sources are typically inconsistent nutritionally, so your pet could be getting something very different each time. This doesn't mean that all unnamed meats are sourced from these less desirable sources, but why take the risk. By-products are primarily bits and pieces that are considered unfit for human consumption. 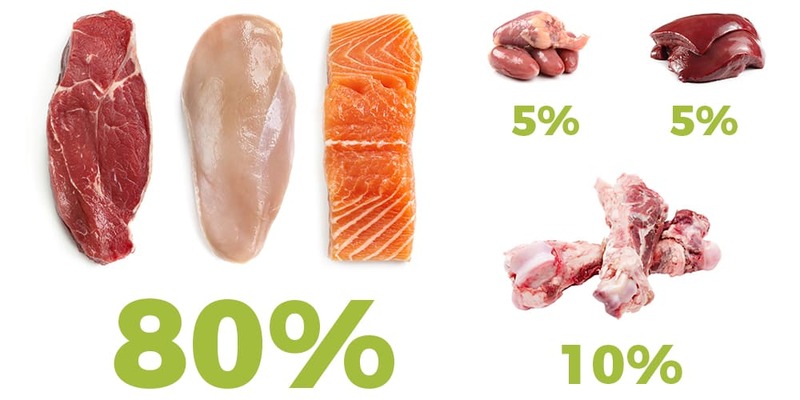 For example, heads, beaks, feet, entrails, and other scraps that offer little to no nutrition may be included, all of which contribute very little to the actual percentage of protein in a food. Some of these things can be quite nutritious, particularly organ meats and bone meals, but due to the high temperatures at which they are processed, many of these nutrients are lost. They are also nutritionally inconsistent. While some of these ingredients are high in protein, they are no longer very bioavailable after rendering, because proteins and enzymes are destroyed or denatured by extreme temperature heating. Meat meals are the result of removing moisture from animal meat. The end product is a higher concentration of highly digestible protein. Although meat meals offer higher protein, they also result in the pet food being more processed. To remove the moisture, the meat is heated and cooked, then the meal is added to the kibble recipe and cooked a second time. This process can also reduce the nutritional value of the protein and breakdown some of the essential amino acids, reducing your pet’s ability to digest and properly utilize the nutrients from the protein. Whole prey diets incorporate meats, organs, bones and marrow. Typically this would be represented as an 80/10/5/5 ratio; 80% meat, 10% bone, 5% liver, and 5% other organs. This style of diet provides a well-balanced diet, similar to that of your dog’s wild ancestors, with an optimal calcium/phosphorus balance to support bone development and maintenance. Maintenance of the skeletal system, especially during growth stages, is largely dependent on the proper balance of calcium and phosphorus in the diet. Calcium and phosphorus are both needed for bone formation, blood coagulation, muscle contraction and many other bodily functions. Calcium is most abundantly found in bone and leguminous plants, while phosphorus is more abundant in meat and organ tissue, making whole prey the most naturally balanced protein source for these nutrients. Organ meat is also rich in many vitamins, minerals, and amino and fatty acids, all of which provide exceptional nutrition and aid in the development and maintenance of all core bodily functions. Cartilage, bones, and marrow are the best sources of calcium, glucosamine, and chondroitin needed to support joint health and maintain mobility throughout the ageing process. Found at the bottom of the ingredient list is the ‘scary’ part of any pet food label. Processed foods, like kibble and canned diets, typically require supplementation to meet the standards for a complete and balanced diet, while raw and fresh foods usually do not require supplementation. This is because the cooking process can diminish the natural nutrients in the ingredients, so supplements are added to ensure that the food contains the proper amount of each essential vitamin and mineral. This section of ingredients can also contain some of the non-essential, but still very beneficial additives, like probiotics, botanicals, and omega fatty acids. When we say essential, we refer to the standards set by AAFCO, the Association of American Feed Control Officials, the governing body that dictates quality standards for animal food. They determined levels of each essential nutrient required for your pet to survive. We can often recognize the common names of the nutrients, but the chemical names of these ingredients can seem a little too scientific for all of us non-scientists. These are just a few of the essential vitamins for pets, but it gives you a general idea of what to look for on the ingredient label. Not every vitamin additive is considered essential, meaning your pet cannot produce this vitamin on their own and it must be supplemented through diet. Vitamins like Vitamins C and E, which are both antioxidants, are often added to naturally preserve the food, or to provide further protection for the pet. Chelated minerals are paired with an amino acid to form ‘complexes.’ These pairings make the minerals more easily digestible. Complexes can be seen with a suffix of ‘ate’, like sodium phosphate, or calcium carbonate. Once you have a good understanding of what all these fancy words mean, it’s a little easier to demystify this confusing list of ingredients. Excessive synthetic vitamins and minerals can also indicate a poorer quality of food. If the ingredients panel show only 2-5 real foods followed by 20-30+ synthetic additives, then the food could be lacking nutrition from real ingredients like meat, fat, and vegetables. An exception to look out for would be limited ingredient foods. These foods typically limit their protein sources to one animal (sometimes multiple sources like deboned meals and organs), and as few other ingredients as possible. This type of diet is intended to help you determine which ingredients your pet can digest and which may be causing a reaction. While limited ingredients foods are nutritionally complete and balanced, thanks to the additives, they aren’t recommended as a permanent diet. Once the allergies or sensitivities are identified, finding a more robust food to accommodate these intolerances is recommended. The goal is to get as many natural sources of these nutrients as possible and supplement the rest with vitamins and chelated minerals. This information can help you decide whether this food has an appropriate balance of nutrition for your unique pet, but it is not always the best way to determine quality of ingredients or digestibility of the nutrients. Is that 32% protein sourced from animal or plant sources? Could that fat be from a less desirable or un-named meat? When choosing a pet food, you have to look beyond the basic information that is offered on the product packaging. While the percentages provided in the guaranteed analysis do help you determine if your pet’s food has the right levels of protein, fat and fibre, they do not represent the pure nutrients that your pet will be consuming, as all food is diluted by a certain amount of moisture (water). To find out the true quantities of nutrients in your dog’s food, you must measure it on a Dry matter basis. Dry matter basis evaluates the whole food without any moisture. Most canned diets contain 70-80% moisture, and most kibble, roughly 10%. Removing this moisture content will give you a more accurate percentage of micronutrients. For example, if a canned food has a moisture content of 75%, then the other 25% contains all of the nutritional value of the food or dry matter. To find out the protein of the dry matter, divide the protein percentage on the guaranteed analysis by the percent of dry matter. Let’s say the protein of a canned food is 9%. Now multiply that by 100 to get your real protein percentage. Although the label on your can of food tells you that the protein is 9%, after your dog’s system separates the nutrients from the moisture, you are actually feeding a 36% protein-rich diet. If you don't like math, here is a simple calculator to help you out. 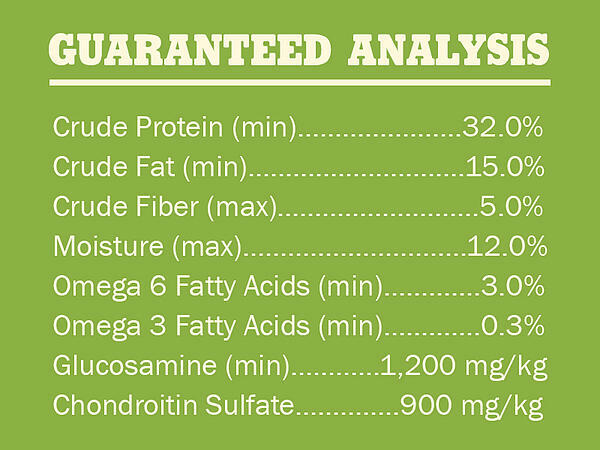 Find these values on your pet food bag's guaranteed analysis. Looking for another macronutrient? You can substitute ash, fat, or fibre in this equation to find these other actual values. Carbohydrates are not listed on your food’s guaranteed analysis. 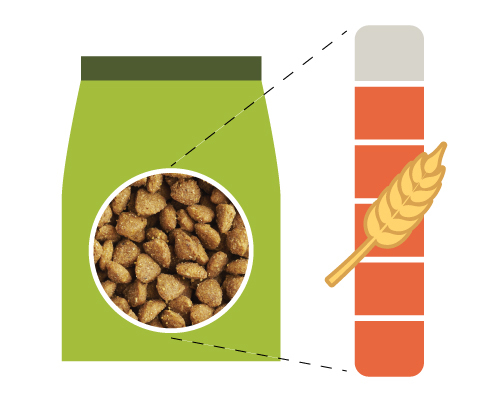 Using the dry matter basis technique, we can roughly determine how much of your pet’s food is made of carbohydrates. Once you've calculated the real quantities of protein, fat, and fiber in your food, we can assume that the bulk of the rest is made up of carbohydrates and plant-based matter. For example, if you’ve calculated that your protein is 28%, your fat is 15%, and fibre is 4.5%, the leftover is approximately 50%. Most of that 50% comes from plant products, some of which will be fruits and vegetables that provide essential vitamins and minerals, but the rest will be starches, grains, and other nutritionally limited ingredients. Having a higher carbohydrate content in your pet’s food may mean that you are feeding a food that contains way more sugars than your pet requires to maintain energy levels, and in some cases can be linked to digestive problems from overfeeding bad bacteria in the digestive tract. Look for foods that use primarily low glycemic carbohydrates, particularly if they are high up in the ingredient list. Beans, peas, and lentils are healthy carbohydrate and fibre sources that have a minimal effect on blood glucose levels, but whole and ancient grains can be a great alternative as well. Ingredients like wheat, corn, and soy can rapidly spike blood sugar, leading to less efficient digestion and more frequent food cravings. Check out our article on Dog Nutritional Requirements to find out more about the effects that carbohydrates can have on your dog's blood sugar levels. It is required that every bag of food lists the calorie content somewhere near the guaranteed analysis. Often, it is listed as a measurement per cup and a measurement per kilogram, which seems pretty standard. Where these measurements can get confusing, is when they are listed as Kcal/cup and Kcal/kg. Kcal stands for Kilocalorie, which is what we refer to in our own diets, as a calorie. To get technical, a calorie, or Kcal as it is properly shown on your pet’s food bag, is the amount of heat (or in terms of digestion, energy) required to raise the temperature of a kilogram of water by 1 degree Celsius. Of course, this information doesn’t really explain much, so to put it as simply as possible, forget about the K, and just view this measurement as calories. A Kcal is a Calorie as you and I understand them in our own diets. Another acronym that you may notice that refers to calorie content, is ME. ME stands for metabolized energy. This is telling you how much energy will be available for your pet to use, after the food has been digested. This means that any energy lost or used during digestion is not counted as part of the total calorie count. Calorie content is important, but not as important as where those calories are coming from. If you think your pet may be overweight and are looking to correct this through diet, don’t be fooled by a low calorie food, because those calories may be provided by poor quality ingredients, or sources that are difficult to digest. In Weight Loss Dog Food: Managing Your Pet’s Weight, we explain what ingredients to look for and which marketing tricks to avoid to increase your chances of successfully improving your pet’s weight. You now have a pretty good idea of what to look for, and what to avoid, when choosing a suitable pet food, but if you still have more questions, feel free to leave us a comment below, email us at customerservice@homesalive.ca, or just pop by one of our locations to chat with our knowledgeable staff. With this information, you should feel confident assessing your dog's current food and seeing if it measures up to what you are really looking for in a pet food. To keep learning, read What does my dog need? Choosing the right dog food, where we look into some nutritional needs that may vary depending on size, breed and activity level. Look at the ingredient panel and guaranteed analysis on your pet's food and see if you can spot anything that might not be what you were expecting. Check out our Pet food Comparison Chart to see how your pet food might stack up to some of the top brands on the market, you might be surprised at what you find. Did you learn anything new? Share with us in the comments!